This time last month (5/19/16, when I started writing this post) my parents and I were checking into our hotel room in Alexander City, Alabama. 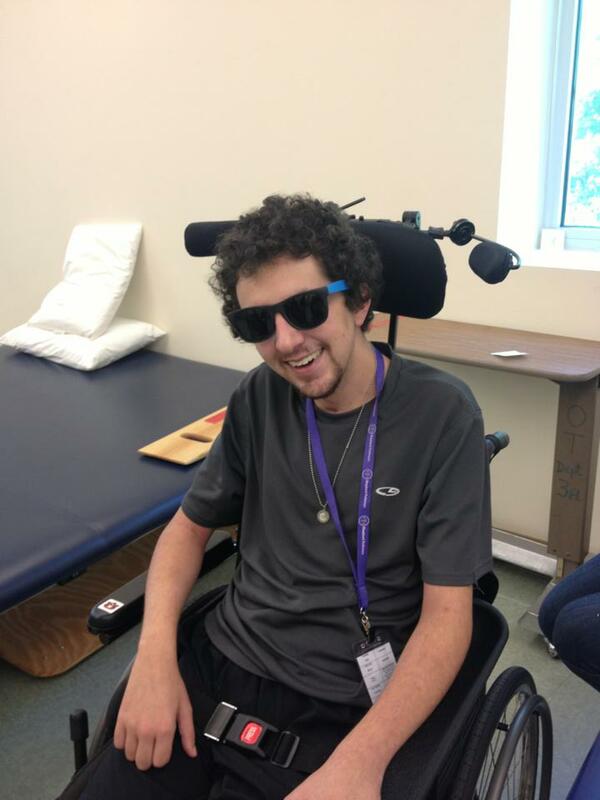 We were doing so in order to prepare ourselves to wake up early the following morning and make our way to Shepherd Center’s adaptive springtime camp Adventure Skills Workshop (ASW). Although it was a GREAT time, I’ve jumped the gun on our full vacation. We had hit the road on Wednesday, May 17 with our Google Maps route set to a hotel in Atlanta as our first destination.The hotel we had setup was the one that my mom had been staying in while I was I was a patient at Shepherd Center, for a little #waybackWednesday. We made it there safely and comfortably on time for dinner at Houston’s with an old classmate from Full Sail University, Andrew Molan and his girlfriend. The next morning we got ready and checked out a little past 9am in order to make it to Shepherd Center’s outpatient facility Pathways, where I had also been a patient and now returned as a guest speaker to share with current patients my experience as a TBI survivor . Me looking too cool for school at Pathways way back when. Before we made it to Pathways we swung into the local coffee shop nearby for a few reasons. The first being so that the three of us could fully embrace our #throwbackThursday in Atlanta we were all having. The second being, for me at least, was to get my coffee fix for the day. The last, and most important reason, was for me to tweak my MUSC PT student presentation for the new purpose of presenting it to Pathways’ patients! This presentation was arranged thanks to my Shepherd Center Speech Therapist, Kimberly Wood, and Pathways’ Speech Therapist, Lindsey Piland, knowing that I’m now a loudmouth and enjoy speaking in front of whoever might be able to further themselves from hearing about my recovery process thus far, whether it might be medical professionals or patients. After my presentation, thankfully, went over well we all then drove to Shepherd Center for a lunch in the hospital’s cafeteria that we had arranged with all of my therapists that I had while there. It was, of course, GREAT to see them all! They truly feel like family to both me and my parents, no questions asked. After their lunch hour was over we went up to the second floor, where I resided while I was a patient there, to see the rest of our Shepherd Center “family”. It was once again great to rekindle each of our relationships with each and everyone of them! And then, while we were up there, we remembered that my Physical Therapist, Meg Canale, had told us that she would like for us to speak to a patient and both of his parents who were all from Charleston as well. Upon me walking into the Charleston patient’s room I once again had a #throwbackThursday/deja vu moment overcome me. It really made me feel good to be walking and feeling said deja vu, as well as giving the patient and father something to look forward to down the road in his recovery. While in his room my parents and I talked to him and his dad about how he acquired his injury and gave them both advice as to how to embrace their new lifestyle change to its fullest. Before leaving his room his mom had just returned, so it was nice to be able to meet her and have them all be there to share our head injury support group’s contact information with all of them. I’m really hoping to meet with them all again in one of our Trident Head Injury Support Group meetings! Shortly after I took the opportunity to show off “my walking skills” with a cane to all of the inpatient therapist that helped me get to where I am today…we hit the road to Alexander City, Alabama (where this entry began)! After spending the night at the Super 8 motel there we checked out and hit the road by 8:30am in order to make it to Camp ASSCA, where ASW is held, by 9am in order to get there first thing and enroll in different activities before they all got booked up! After getting my weekend activities all planned out the first thing I did was go to the camp’s pool to see Dr. Q for her to conduct my swim test. This is always the first thing I do when starting out my camp activities in order to gain access to water activities and show that I’ll be able my hold to my breath and flip my self around in a reasonable amount of time, in case of a spill while on the lake or in the pool. Shortly after passing my swim test we then made our way to the climbing wall. I had scheduled this activity as my first one because that one tends to be my second favorite. 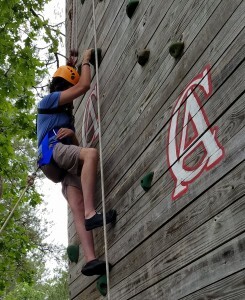 After getting all suited up with a harness and, of course, a helmet, I began the rope pull climbing wall. I was honestly a little disappointed in the time it took me to reach the top, but everyone down below said that it wasn’t half bad. 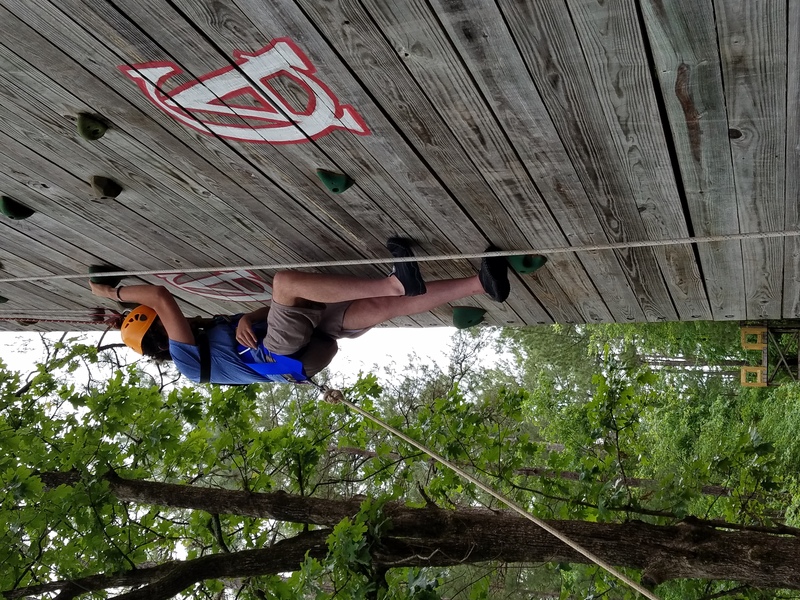 Bad timing or not, I reached my goal of making it to the top of the wall and was able to coast down on the zip line, or the key reason as to why this is my second favorite activity! After getting back to my chair we then rolled over to my number one favorite activity of kayaking, This activity is my favorite because of the peace and serenity kayaking has ALWAYS had on me, even before my accident. 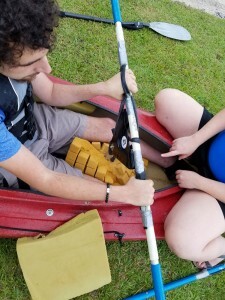 Another reason I enjoy this activity at ASW is because it is organized as a first come first serve activity that tends to always have an open kayak ready to go! Following my favorite activity was then the camp’s lunch-hour. We had the pleasure of giving ourselves a regular table of campers to eat at our table, on a whim. They included Juan Machado, a spinal cord patient that we had met last year, and Tate Mikkell, a fellow Trident Head Injury Support Group (THISG) member whose mom, Marsha Mikkell, was nice enough to bring him. The other fun thing about lunch is seeing fellow returning camp members upon finishing meals and talking with them about what they’ve been up to since seeing them the previous year. Not to mention being able to see the all of the improvements that each and everyone of the campers made over the year, whether they be big or small! When we finished dinner we then went down to Camp ASSCA’s new art room, below the cabin with our room in it. While there we each made our own custom made tie-dyed shirt. This is always a fun activity to me and allows us to bring home wearable souvenirs to remind us of the “groovy” time we had at ASW any given year! At the end of our first day at ASW 2016 I decided that it’d be a good idea to pass on the camp fire and s’mores and go to bed a little early in order for me (and my parents) to have a good amount of energy for the following full day of ASW activities. Upon waking up a little before our clocks hit 8am we all got ready for a camp breakfast. We had yet another good time with the same group of campers making up our table. We all mostly shared what each of our schedules were for the day and looked back onto the day before and how much fun we all had. When breakfast was over we then headed down to the lake for me to get ready for the waterskiing time that I had scheduled. When we first got down there it hit me that I didn’t think about the water being colder in the morning than it might be later in the afternoon. So, after getting in and feeling the fridget temperature I could feel my muscle spasms (tone) take full effect! After the boat managed to pull me out of the water I was VERY thankful to now be feeling the cool breeze being created by the high speed pull of the boat, believe it or not. My favorite experience of this activity at ASW this year (2016) was that I was able to que myself and sway around within the inner wake with a little oblique leaning going on! 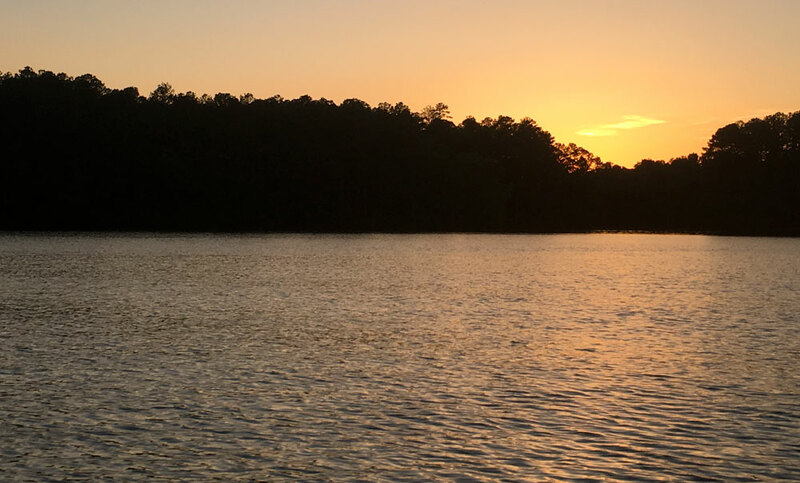 When I could tell that the boat had started heading back to the boat ramp that we had started at I felt the fear of my body hitting the cold water, and my tone overreacting, again overcome me. The cool thing was though that when I became fully emerged again I found that the activity of waterskiing surprisingly warmed up my body enough to overcome the coldness of the morning’s lake water temperatures! Shortly after being back on dry-land I followed through with my next scheduled ASW activity and jumped right back on the water, via jet ski! This was a great activity to work my obliques last year, and this year was no different…except for the fact that we added 10 more MPH to the speedometer (from 30 to 40MPH). 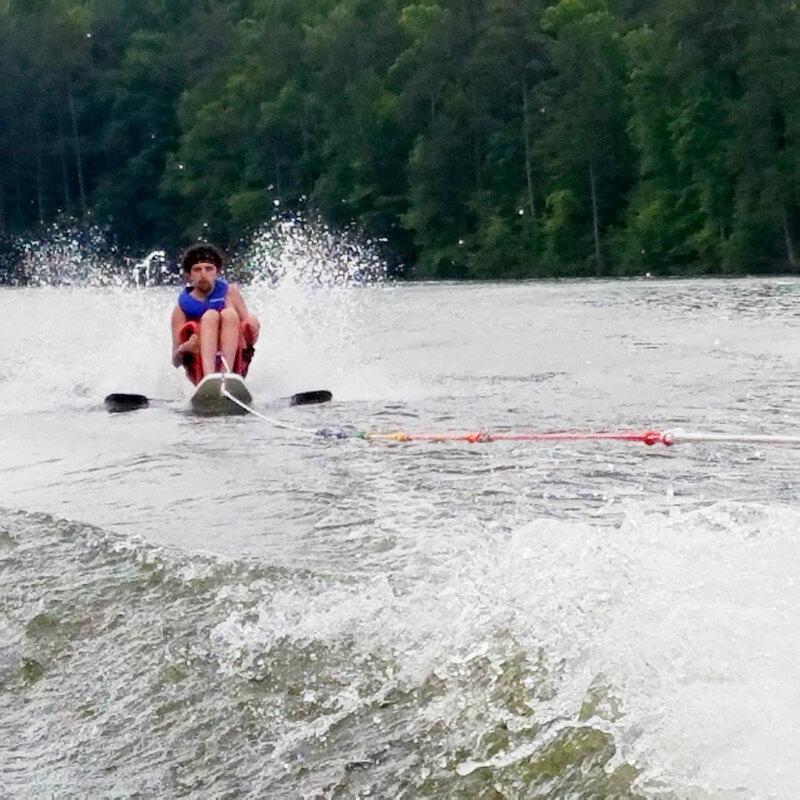 Not to mention, that I was able to comfortably maintain my spot on the jet ski itself! I was very surprised by this last statement, but I need to be completely honest with all of you, loyal, blog readers that have read this far into this post as to why I was surprised. I had woken up mid-sleep the night before with a little fear that I might fall into the water due to my, so thought, weaker stature while either waterskiing and/or jet skiing. I was VERY happy that I had proved my insecure self-conscious wrong once again! I decided to treat myself to my favorite activity once again post proving myself wrong, as a reward to one’s self! I also wanted to make it a point to get back to kayaking the second day of camp because of the therapists running that activity. I say that because they had an adaptive paddling device that we had toyed around with the day before, but we all really wanted to put it to use the following day. Upon getting me on the water in a tandem kayak with an University of South Alabama student, Kate Brueggenheimer, and a new Shepherd Center Occupational Therapist who specializes in brain injuries, Christine Stewart, rode nearby us on her own single person kayak so that she’d able to correct any malfunctions I had while using the device in realtime. It definitely had its complications, but we all had different ideas of how we could make it work with various materials that we did not have onsite this year. Therefore, we all made a promise to one another that we’d be sure to bring whichever material we had in our own mind to camp next year and AT LEAST one of them would surely fix the problems we were having! After partaking in three different activities ON TOP of the water we headed to the pool so that I could go scuba diving UNDER the water! It had been fun for me to get in the water and put my swimming to the test the past two years, but this year scuba diving was fun in a different way. Before going under with the professional divers they showed me a cool little diving propulsion devise that one can just hold in front of themselves and move right along. I was definitely looking forward to the underwater standard swimming portion of this activity, but this looked too fun to pass up! Toying around with the newfound device definitely made it hard for me to resurface with the real world on the other side of the pool water and me. When I finally HAD to resurface it was time for our last meal and table real bonding moment with our regular table mates. I could definitely tell that everyone had had just as great of a time at ASW with their full days schedule as they did the day before, plus some! When dinner was coming to an end we gave everyone at the table our formal goodbyes because we knew that we would be leaving in the morning before breakfast was to be served. But, before we would leave in the AM we all had one more evening activity to partake in. That activity was really not much of an ACTIVE-ity at all. I say that because it was just a leisurely sunset pontoon boat right for just eight camp goers, ourselves included. With the GREAT weather conditions, TRANQUIL waters and a BEAUTIFUL sunset it was an absolutely PRICELESS way to end the day and ASW 2016 as a whole! Then, to make our little vacation even better, the back roads (back?) to Charleston were wide open with not much traffic! We also had the pleasure off making a pit stop at Lake Oconee, GA at my Aunt Sherry and Uncle Ray’s house! I hadn’t seen Aunt Sherry since I was a patient at Shepherd’s Pathways much less interacted with either of them since I was about five years old. With that being said, it was GREAT to both of those things, but it also felt good to walk into her house and show her how far I have come since last seeing her! A sunset photo taken from the pontoon boat the last day of ASW 2016. Anthony, it sure sounds like you had an even better time than last year. I am so proud of all your accomplishments and progress. Keep up your motto, “slowly but surely”!!! So proud of you Anthony. You have come a long way and I told you some years ago that I knew you would walk again. We are all proud at how much you have accomplished. LOVE this blog! You are a remarkable young man – not to mention you’re a fantastic web designer. I see a full recovery in your future. You are an inspiration to all those around you. Slowly, but surely! The way you embrace these activities is awesome! It sounds like so much fun! Keep sharing your experiences. Austin loves water sports This gives us something to look forward to.